The MGSDP is a non-statutory, collaborative partnership between public bodies involved in managing surface water, water quality, flood risk, investment planning and economic development in a regulatory, service provision, asset management and / or infrastructure provision capacity. 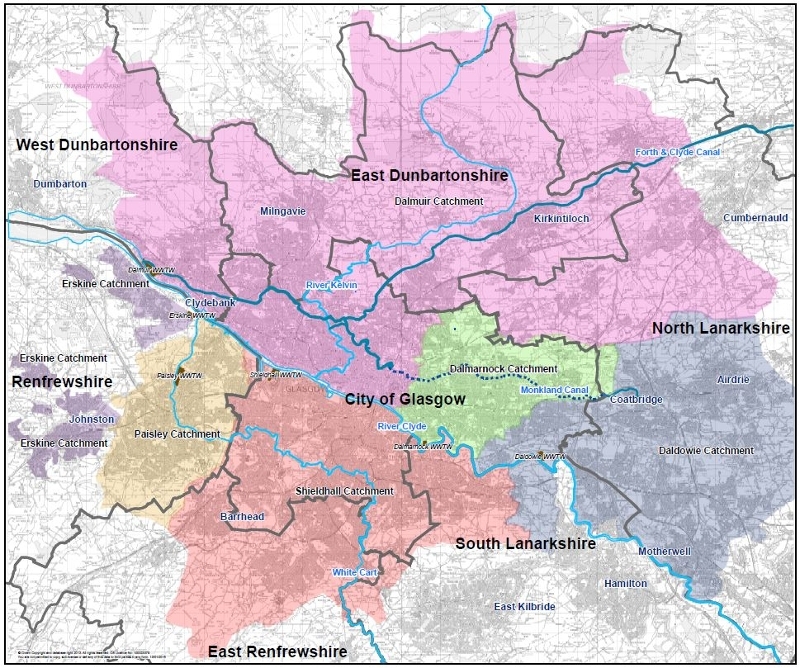 The MGSDP area is taken as being the extent of the four main Glasgow wastewater treatment works (WwTWs), plus Paisley (Laighpark) WwTW and Erskine WwTW, as indicated by the shaded areas on the plan below. The MGSDP recognises the complex nature of drainage and the management of rainfall and flooding, with many agencies responsible for different aspects of drainage systems. In addition, there is a duty on all public bodies to work effectively, efficiently, in an integrated manner and in the spirit of collaboration, to deliver best value. As such, the MGSDP recognises that its aims and objectives cannot be met without the help and involvement of all key stakeholders / partners, meaning that a partnership approach is essential to tackle the challenges and deliver a drainage network that will facilitate growth and regeneration for decades to come.